North Vancouver, British Columbia, has the best of two worlds: the City of North Vancouver has an urban feel, and is home to many fine restaurants, shops and cafes; while the District of North Vancouver reaches out to the North Shore Mountains, and has a much more rural and rugged feel. When staying at a North Vancouver Bed and Breakfast, there is easy access to both worlds. Craving the city? Visit the Longsdale Quay public market and catch the Seabus ferry to downtown Vancouver. Craving fresh air? Take a cable car lift to the top of Grouse Mountain for breathtaking views of the city, mountains and coast. To get some exercise, forego the cable car and hike up the Grouse Grind trail, which is as challenging as it sounds. Running and mountain biking are extremely popular in North Vancouver, and with good reason. Some of BC’s most challenging trails for feet and wheels are found here. The Baden-Powell Trail – home to the annual Knee Knackering North Shore Trail Run – stretches fifty kilometers along the BC coast from Horseshoe Bay to Deep Cove. It traverses Lynn Canyon Park and crosses the Lynn Canyon Suspension Bridge, which delicately hangs fifty meters above the bottom of the Canyon. Few cities in the world have such immediate access to skiing as North Vancouver. Nearby Grouse Mountain and Mount Seymour enjoy great snowfalls, and are popular spots to snowboard and ski. When winter rains come to Vancouver, one need only head up the mountains. Or stay low and enjoy views of the mountains from the Strait of Georgia. There are innumerable opportunities to get out on the waters off North Vancouver. Take part in guided kayak tours, sailing trips, or fishing excursions. Once off the water, warm up with a cup of tea (or something stronger) at your North Vancouver BC Bed and Breakfast. Our North Vancouver B&B is located on the quiet North Shore but only 10 min. to skiing, shops, restaurants, hiking trails, beach or 30 min. to downtown Vancouver. Welcoming hosts serve a great continental breakfast. B&B Rooms have en suite or private bathroom and views. B&B Guest lounge and garden. 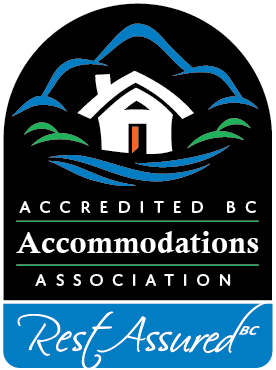 Internationally acclaimed Bed & Breakfast Inn located in North Vancouver British Columbia. Antiques, fine art, fireplaces, superb gardens, deliciously creative breakfasts. Romantic. Our Bed and Breakfast offers six exquisite en suite B&B guest rooms to choose from. Clean, traditional B&B home in very quiet neighborhood in the heart of North Vancouver. B&B Rooms with queen and king beds, private baths, fireplace, suite with jacuzzi tub and private entrances. Long time B&B hosts have been operating since 1986. German and Slovenian spoken. 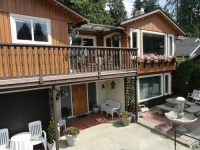 Crystals View Bed and Breakfast located in North Vancouver, British Columbia offers luxury, elegance, comfort, and beauty, with a charming European touch. Large, bright, cozy, tastefully decorated B&B guest rooms with Vancouver city skyline and ocean views.